Colorado has fallen, and NYC Mayor Bloomberg's "Mayors Against Illegal Guns" is rejoicing. And, they are pressing on to destroy gun rights in other states they see as vulnerable, by carpet-bombing them with fake Fudd pro-registration ads. Below is an image from Bloomberg's $12 million ad campaign that will be running in North Carolina, and 12 other states: Arkansas, Arizona, Georgia, Indiana, Iowa, Louisiana, Maine, New Hampshire, Nevada, North Dakota, Ohio and Pennsylvania. I am sad to see this targeted at my state, because many people will go along with it, right up until the whole state is disarmed. WHEN WILL GUN OWNERS FIGHT BACK? Doomberg's Fudd actor, with booger hook on bang switch. UPDATE 4/16: NRA runs an ad that shows this phony actor for what he is, and even suggests he take an NRA gun safety course! HA! The whole thing is as phony as a Mississippi travelin' snake oil salesman. We know Bloomberg wants to ban everything: rifles, handguns, and shotguns. He wants these United States to be just like England, completely disarmed, except for the crooks, the bodyguards of the elite, and the government. "I believe in the Second Amendment and I'll fight to protect it. But with rights come responsibilities. That's why I support comprehensive background checks so criminals and the dangerously mentally ill can't buy guns." "Background checks have nothing to do with taking guns away from anyone." The euphemistic "comprehensive background checks" that Bloomberg (and Obama) seeks is really a COMPREHENSIVE NATIONAL DATABASE OF GUNS AND GUN OWNERS. That is a requirement for confiscation. Obama's own Department of Justice has told him so. 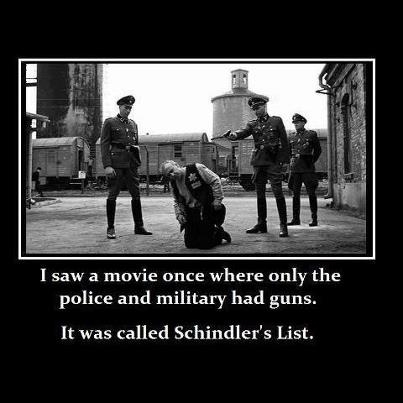 And registration was followed by confiscation in California, New York, England, and Australia. And Hitler's Germany. When was the last time a criminal submitted himself to a background check to buy a gun? In fact, the 5th Amendment releases them from having to go through them! Don't believe me? Read the Supreme Court case Haynes vs. U.S. (1968), where the Court ruled that convicted felons have a Constitutional right to not register a gun, because to register a gun would be self-incrimination! Only people that aren't criminals can be punished for not registering. If the criminals aren't required to register, but you and I are, why bother passing so-called universal background checks? Power and control, that's why. Bloomberg wants this nation to reach the point where if the cops see anyone with a gun, anywhere, at any time, they are automatically a criminal, and can automatically be gunned down by "The Only Ones" on the spot. That, friends, is tyranny. And most people in this country, sad to say, will swallow it whole, for the illusion of safety, but actually accepting the chains of slavery. And people like me will suffer and die for it. Alright, dang it, I'll post one of the ads so y'all can see it. I don't want to give these people views, but we've got to see it to evaluate it. “If you say should we keep the mentally ill and the -- and the criminals from getting guns, everybody would say yes. But that's not what this is about,” said Rove. “We're talking about, in this instance, having a registry where if a grandfather wants to give a treasured shotgun to his grandson, or granddaughter, he has to register with the government and go and get approval as the government to give that gun to his grandchild. “Sen. [Charles] Schumer [D-N.Y.] for some reason or another, insists upon keeping a registry of guns. Now, if there's one thing that scares a lot of people who believe in the Second Amendment, is the federal government keeping a national registry of gun sales, and gun purchasers, and gun owners,” Rove continued. “People have a fear of this. Why do it? Why do you need it?” said Rove. Emphasis supplied by Ol' Backwoods. You know why they "need it". It is for confiscation, and extermination. GunWatch believes this effort by Bloomberg is bound to go down in failure, and that the whole thing is reminiscent of Kerry's "can I git me a huntin' license" photo op. In the advertisement, you see many cultural referents designed to create a link to the rural gun culture. There is a pickup truck, a beard, a plaid shirt/jacket, children in the background playing on a tire swing. But all that is undercut by the body language of the actor who is transmitting the message. It is clear that the gun is merely a prop. It is hard for me to pin exactly what screams "fake" to me from the screen. Maybe it is the time of year. Maybe it is the way he is positioned on the truck. Perhaps more alert viewers will be able to explain it better. I do not think that Mayor Bloomberg is going to be able to fool many people in the gun culture with this message, and I do not think he will convince many outside of it to action. (Emphasis from Ol' Backwoods.) Let's hope he's right about how effective the ads will be. Bloomie has been far too successful lately. Appearing on NBC’s “Meet the Press,” LaPierre was reacting to Saturday’s announcement by Bloomberg of a new $12 million television ad campaign from Mayors Against Illegal Guns to help push senators in key states to back gun control efforts, including comprehensive background checks. "He can't spend enough of his $27 billion to impose his will on the American people," LaPierre asserted. Bloomie has a lotta billions to blow, Wayne. And he has that Napoleon attitude to go with it. New York City Mayor Michael Bloomberg said on Sunday: Sometimes government does know best. And in those cases, Americans should just cede their rights. “I do think there are certain times we should infringe on your freedom,” Mr. Bloomberg said, during an appearance on NBC. Dear Lord! This guy actually thinks that? This statement alone should be his downfall, but it won't be. Most people in NYC probably agree with Bloomie. AL SHARPTON: No doubt about it. BARNICLE: I mean, it's out there. DAN SENOR: I don't think it's anti-Semitism. I think it's the perception of big-city urban elites, wealthy elites, telling the rest of the little people how to live their lives. SHARPTON: But if he were not a big-city Jewish man, in some parts I think it would be different. Oh, and let's be sure to tell the folks at Jews for the Preservation of Firearms Ownership about this. Ol' Backwoods is a member, and I'm as Gentile as Cornelius. Emily Miller, that national treasure of a journalist, points out that Ad #2 violates 3 of Col. Cooper's (and the NRA's) 4 Rules of Gun Safety. I didn't even think about him having the action closed on his shotgun. She's right! The first rule is to always keep the gun pointed in a safe direction. In this case, the children are playing in the yard. Although the viewers can’t see what is to the side of the truck, the man should be pointing the muzzle in the air or at the ground. The second NRA rule is always keep your finger off the trigger until ready to shoot. In the ad “Responsibility,” the man has his finger on the trigger, as if ready to shoot. While doing this, he says, “I believe in the Second Amendment, and I’ll fight to protect it. But with rights come responsibilities.” To make an ad demonstrating gun safety, the man would put his forefinger straight above the trigger guard on the firearm to indicate it is in a safe mode. The third NRA safety rule is always keep the gun unloaded until ready to use. This would mean the man is in a situation where the gun is available for immediate use — such a deer could step out at any time while hunting or the firearm is safely stored but ready for quick self-defense as needed. While saying this, he holds the pump-action shotgun with the action (bolt) closed, so it is impossible to know if it is loaded. To make this a demonstration of safety, the bolt would be wide open to demonstrate that it is unloaded. It sickens me that this tyrant thinks he can buy off my state for the sum of $593,000. As always, whenever you see a pro-gun control ad, on Youtube or elsewhere, the comments are shut off. That is the measure of how weak their argument is: they cannot bear controversy. Indeed, dj. Doomberg's group knows this is astroturf, hence the need to cut off comment. But a lot of low-information voters will buy into this. Of course the comments on MAIG's YouTube channel has been turned off. Those who are afraid of words like "common sense" ALWAYS turn off comments. Only young children and those who have lost their ability to reason (i.e. politicians) blame the tool used to commit an act rather than the person committing the act. Right you are, Dirk. It's downright Freudian, isn't it? Yeah, we got blindsided in Colorado. We do have a State Constitution with a 2nd Amendment. The courts are next. I wouldn't want to be Democrat running statewide in 2014. Us old shellback Blue Dogs won't lift a finger or open our wallets to help. If the GOP can pull their heads out of ...... and put up a candidate who isn't a nut case, or a crook, or both, then Mark Udall will be a one term Senator. He just voted against SA 139 preventing the UN Small Arms Treaty (as did our other asshat, Senator Bennett). We have laws in our various states that allow your guns to be seized if you are no longer considered a "fit and proper person" to hold a firearms license. I expect there will soon be a time when the blogs I read are considered reason enough to confiscate my firearms, and I know this will happen to many Australians two or three or ten at a time. Never lets what happened in Australia happen to you Americans. Freedom lives and dies on your watch. p.s. This poser in the video got me to thinking what his cradling that gun reminded me of. It made me recall the first time I held my newborn son, y'know, completely afraid I'd "get it wrong". It wasn't natural to me like it is now. It's the same way this tool looks holding this shottie. Completely out of his depth but doing his best to appear confident.